You’d never think a young athlete would have to worry about cardiac arrest. If this rec center in mount airy had had a defibrillator five years ago, Danny Rumph might still be here. Rumph was only 21 years old when he collapsed on this court. Since then, his family raised money to buy a defibrillator for the center that now bears his name. Eleven other rec centers now have one as well. But more than 100 do not. “I really think that that’s horrible,” Owens said. A defibrillator costs almost three thousand dollars. But Danny Rumph’s family insists rec centers can’t afford not to have them. “I think we need to make this a priority. And we need to talk to our leaders, and they need to understand how important that this is,” Russell said. Danny’s family is still trying to raise money. So far the Phillies have made a contribution but none of the other city’s sports teams have. 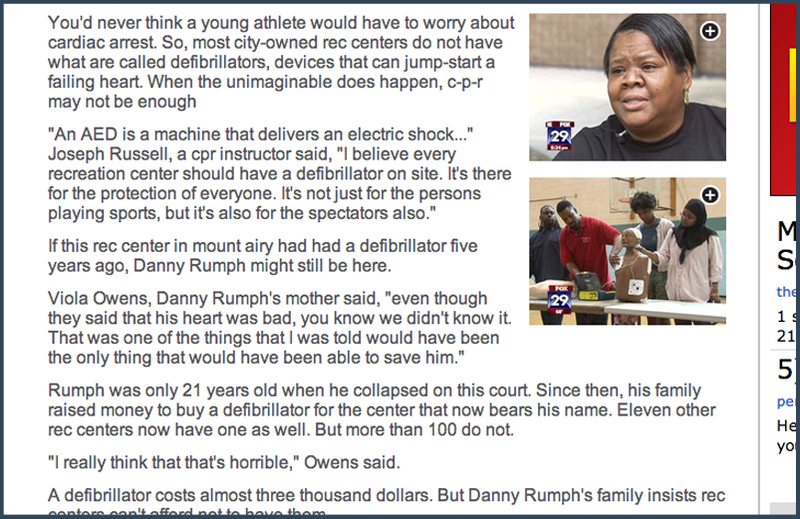 So at this point the vast majority of recreation centers in the city do not have defibrillators, which means what happened to Danny Rumph could still happen again.